The construction of the Champ Baly cut-and-cover tunnel served as a pilot project for the application of High Performance Concrete in Switzerland. The cut-and-cover tunnel of Champ Baly (see Figure 1) is situated on the motorway A1, connecting Lausanne with Bern, in Switzerland. Construction work began in July 1998 and the end of the concrete pouring phase was in August 1999. The cross-section of the tunnel consists of two reinforced concrete vaults. The length of the tunnel is 230 m and the volume of concrete used is approximately 6000 m3. The concrete has been poured in twenty-one stages, i.e. nineteen 11.60 m long vaults and two 6 m long portals. The first 9 stages are built in ordinary concrete and the last 12 stages in high performance concrete. 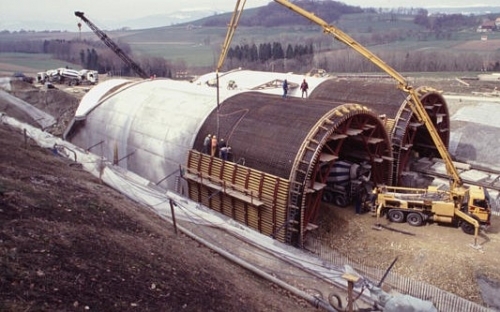 The construction of the Champ Baly cut-and-cover tunnel served as a pilot project for the application of High Performance Concrete in Switzerland. The Structural Concrete Laboratory of the Swiss Federal Institute of Technology (IBAP-EPFL) is conducting a research project to assess potential durability gains from the use of concrete with silica fume. Its personnel was responsible for the measurement readings. The SOFO measurement system was selected for the early age and long term monitoring of longitudinal deformations in two reference sections of the tunnel. One section is built of ordinary concrete, and the other one of high performance concrete. The aim was to compare the behavior of these two sections. Only the ordinary concrete section is presented here. 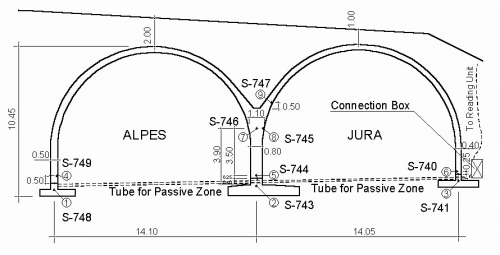 The section has been equipped with nine 4 meters long SOFO sensors and nine thermocouples prior to the pouring of concrete, as shown in Figure 2. Each thermocouple is placed close to one sensor, which allows measuring the concrete temperature at each sensor location. In Figure 5 the thermocouples are represented by numbers (1, 2, … 9) and the sensors by “S” followed by their respective serial number (S-740, S-741, etc.). The measurements start with the casting of the foundations. Since the early age deformation of the foundation was not of interest, only periodical measurements are done. 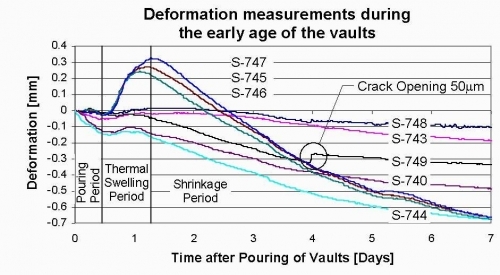 The vaults early age deformation was monitored during seven days following concrete pouring. Measurements were recorded automatically every 30 minutes. The early age deformation and the temperature measurements are shown in Figure 3. Three different periods during the early age deformation are distinguished and separated by lines in Figure 3. The first period corresponds to the pouring period. During this period the concrete is cast with the sensors measuring the corresponding deformation. The second is the thermal swelling period. During this period the hydration process is activated, the temperature increases and induces the deformations too. The concrete is set and stresses are generated in the vaults. The third period is the shrinkage period, during which the deformation is generally decreasing due mostly to the thermal shrinkage of concrete. A 50 micrometer wide crack opening was recorded by sensor S-749 and later visually confirmed on the structure. The crack is a consequence of the vault-foundation interaction and the early age deformation provoked by thermal stress.